About "How to construct a triangle when two angles and one side is given"
To construct a triangle when two angles and one side is given, we must need the following mathematical instruments. Draw the line segment XY = 6cm. 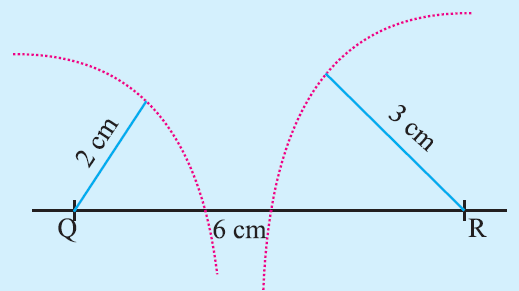 Using protractor, at X, draw a ray XP making an angle of 30° with XY. Using protractor, at Y, draw another ray YQ making an angle of 100° with XY. The rays XP and YQ intersect at Z. 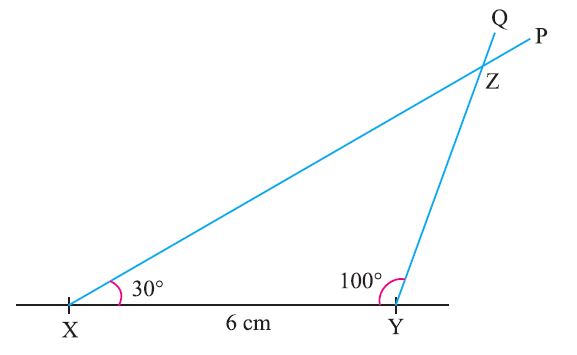 Using the property, "Sum of the three angles of any triangle is 180°", we can find the third angle which is 50°. That is, <Z = 50°. Now, XYZ is the required triangle. This construction clearly shows how to construct a triangle with the mathematical instruments ruler and protractor when two angles and one side are given. If lengths of all the three sides are given, can always we construct a triangle ? Let us get answer for the above question with an example. After having gone through the stuff given above, we hope that the students would have understood "How to construct a triangle when two angles and one side is given"